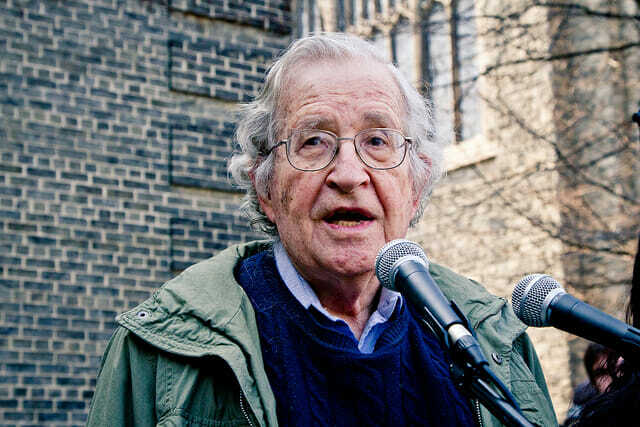 Author and political activist Noam Chomsky. 1 Oct 2018 – In “Manufacturing Consent: The Political Economy of the Mass Media” (1988), authors Edward S. Herman and Noam Chomsky identified what they called the “five filters of editorial bias”: Size, Ownership and Profit Orientation; the Advertising License to Do Business; Sourcing Mass Media News; Flak and the Enforcers; and Anti-Communism. Last week, Chomsky explored this topic and more in an exhaustive interview (“American Dissident”) with The Intercept’s Jeremy Scahill. What follows are just a few of the activist author’s more trenchant observations and digressions. There’s an authentic constituency of corporate power and private wealth, and they’re being served magnificently by the executive orders [and] legislative programs that are being pushed through. [These] represent the more savage wing of the traditional Republican policies catering to private interests, private wealth, and dismissing the rest as irrelevant and easily disposed of. At the same time, [Trump] is managing to maintain the voting constituency by pretending, very effectively, to be the one person in the world who stands up for them against the hated elites. And this is quite an impressive con job. How long he can carry it off? I don’t know. He’s being lambasted for taking positions which, in my view, are pretty reasonable. So, for example, in the case of Korea: The two Koreas, last April 27th came out with a historic declaration, in which they laid out fairly explicit plans for moving towards reconciliation, integration, and denuclearization of the peninsula. They pretty much pleaded with outsiders—that means the United States—to permit them to proceed, as they put it, on their own accord. And so far Trump has not interfered with this very much, calling off temporarily at least the military exercises, which he has correctly said are highly provocative. He’s been lambasted for that, but it’s exactly the right position I think. Right now, President Moon is in North Korea, [and] if they can make positive moves on their own accord—as they’ve requested—that should be beneficial. Raising questions about NATO, for example, is quite a reasonable thing to do. One might certainly ask why NATO even exists after the collapse of the Soviet Union—not that there weren’t questions before, there were—but the official story was that NATO was in place to defend the West against the Russian hordes, which, putting aside the validity of that claim, was the official stand. What is true is that after the collapse of the Soviet Union in 1990, 1991, there was a period under Yeltsin in which the United States pretty much dominated what was happening in Russia and the region around Russia. NATO was expanded. The Russian economy totally collapsed under the imposed harsh market reforms. There was a radical collapse of the economy, sharp increase in the mortality rate. Russia was really devastated. … I would not like to have dinner with [Putin], but you can understand his policies. His policies were to try to restore some role for Russia at least in its own region of the world. … We might recall the traditional invasion routes through which Russia was attacked [were] virtually destroyed several times in the last century. Well, the first point to bear in mind … is that Assad is a horrible war criminal. The bulk of the atrocities, which are enormous, are his responsibility. There’s no justifying Assad. On the other hand, the fact of the matter is that he is essentially in control of Syria now, thanks largely to Russian [and] partially to Iranian support. The Russians actually entered Syria extensively after the CIA had provided the rebel forces, which are mostly run by Jihadi elements, with advanced anti-tank missiles which were stymieing the Syrian Army, at which point the Russians came in with air power and overwhelmed the opposition. The current situation is that Assad has pretty much won the war. Like it or not. There was in the early stages a Democratic, secular, quite respectable opposition, but they were very quickly overwhelmed by the Jihadi elements, supported from the outside — Saudi Arabia, Qatar, the United States, and others. The United States, like other great powers, does not pursue humanitarian objectives. It pursues objectives determined by power considerations, and they lead to different positions with regard to the Kurds or others at different times. If you read a major newspaper, say the New York Times, you get a certain range of opinion. It’s narrow. It’s basically centrist to far right, but at least it’s a range of opinion. Those who are more addicted to social media tend to turn directly to what supports their own views, not to hear other things, that’s not a good thing. Google, Facebook and the rest, those are commercial institutions. Their constituency is basically advertisers, and they would like to establish the kinds of controls over their consumers that will be beneficial to [a] business model that enabled them to get advertising. That has very serious distorting effects. And we know that they provide massive information to the corporate system, which they use in their own efforts to try to shape and control behavior and opinion. All of these are dangerous developments. The power of these private corporations to direct people in particular [is] a serious problem which requires considerable thought and attention. Jacob Sugarman is the acting managing editor at Truthdig. He is a graduate of the Arthur L. Carter Institute of Journalism whose writing has appeared in Salon, AlterNet and Tablet, among other publications.